This three day class includes instruction of contemporary and geometric designs incorporating the unique foliage weaving and braiding techniques of Phil Rulloda. Students will learn accelerated techniques used for armatures, hand-tied bouquets, and experimental and interpretive designs. "You’re in it to win it!" Learn techniques that will help you bring home the prize! 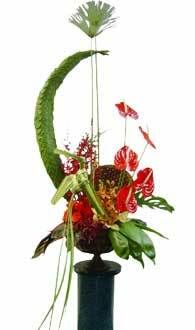 Ikebana - A practical application for commercial use. Instructional usage of tropical and exotics. High-style treatments, dimension design, abstract and geometric designs incorporating the unique and contemporary concept of Phil Rulloda. Experimental - interpretive design and accelerated techniques. Designing for competition - learn the techniques that will help you win.